The 2014 Handwriting Curriculum says that children should learn to form all their lower case and capital letters plus digits 0 to 9 by the end of Year 1. They then need to start joining their letters in Year 2. On this page we will provide you with information which will enable you to support your child at home. Provide equal opportunities for all pupils to achieve success in handwriting. Present work to variety of audiences neatly. Help children recognise that handwriting is a form of communication and as such should be considered important to be effective. Encourage children to take pride in all of their work across the curriculum. Build in cross-curricular links to broaden experience. Help children recognise that handwriting as a life-long skill and will be a fundamental element of all forms of written communication throughout their lives. Display neatly presented work around the school as a model of excellence for others to aspire to. Chair and table should be at a comfortable height. The table should support the forearm so that it rests lightly on the surface and is parallel to the floor. Encourage children to sit up straight and not slouch. The height of the chair should be such that the thighs are horizonal and feet flat on the floor. Tables should be free of clutter. Rooms should be well lit. Left handed pupils should sit on the left of their partners. Young children develop the skills needed to write through both gross and fine motor movements. Gross motor control is the term used to describe the development of controlled movements of the whole body, or limbs (arms or legs). 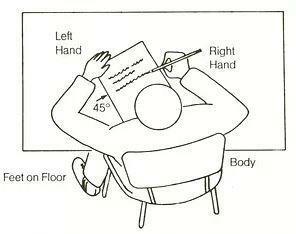 Of particular importance in relation to handwriting is the development of good posture and balance. Activities such as dance, football, cycling, gripping climbing frames and building with large-scale construction kits all develop gross motor control. Fine motor control is the term used to describe smaller movements, usually of the hand and fingers. Fine motor control is best developed through activities which involve small-scale movements. Activities such as drawing with dry wipe pens, felt tip pens, chalk and paint, chopping and peeling in cooking activities and using small construction toys all develop fine motor control. At Courthill Infant School all children are introduced to Cursive Handwriting from the start. We believe this raises standards in the Early Years Foundation Stage which has an impact through the whole school, developing confidence, accuracy and fluency with improved presentation. We refer to ‘shape’ families, which helps children to remember the direction in which the letters are formed. Whilst teaching and supporting the children to form their letters we will constantly use the words: up, down, around and flick. Regularly using this vocabulary also helps trigger memory for letter formation. The cursive script gives directional flow from left to right and the same starting point for every letter and word. When writing on lined paper, the children should be asked to place the pencil or pen on the line to start, every time, with an approach stroke. 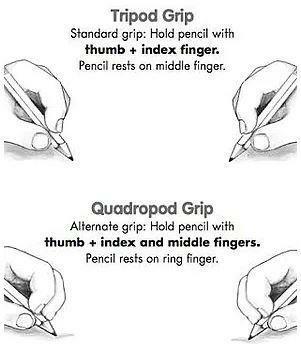 This is invaluable for the child whose writing floats off all over the page. The use of this “anchoring point” helps to overcome this problem very quickly. The letters should finish with a ‘flick’ to facilitate joining later.